I got my VR hardware fairly quickly after launch, as I mentioned before, only one week late for both the Vive and Rift. This limited access of course had me thinking about what I could do to have some fun online, and Photoshop was the obvious answer. I worked on both the Rift and Vive and I’ll detail what I did in this entry. For the Rift I went with some old school stuff, it was an idea I had gotten ahead of time and knew I just had to make, see if you can tell where this is from. If you couldn’t guess it’s the pre-Kickstarter logotype for Oculus, they’ve changed their that twice since but this is what they had on their site from the beginning. The graphic itself was made by Denny Unger of CloudHead Games in the MTBS3D forums. After finishing the picture I published it on Twitter, it didn’t gain much traction but no fret as it was a quick job with a fairly obscure reference. 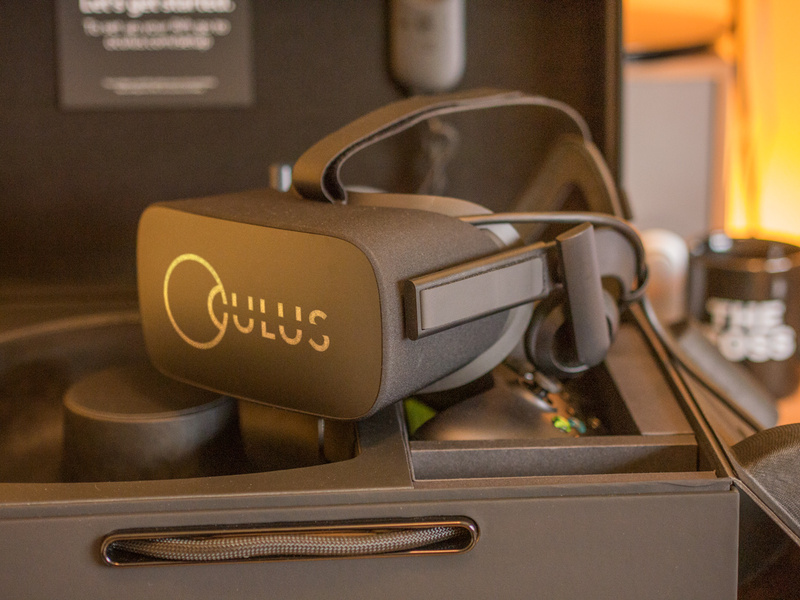 I did think more people in the VR community would catch on, but no matter. Below is an animation I made to show how it was done, I’ll mention the most interesting parts in text. The main thing that made this look authentic was the slight bulge distortion, layer blending mode and most of all the lens blur filter. The blur really does a whole lot to make it look like it belongs due to the shallow depth of field in the photograph. I prepared a gradient that matched depth of the front of the headset and used that as a depth map to gradually blur the logotype. I published it and thought no more of it, until people on Reddit thought it was real, so I zoomed in and was baffled myself how authentic it actually looked. This is one reason why I made the how-animation. 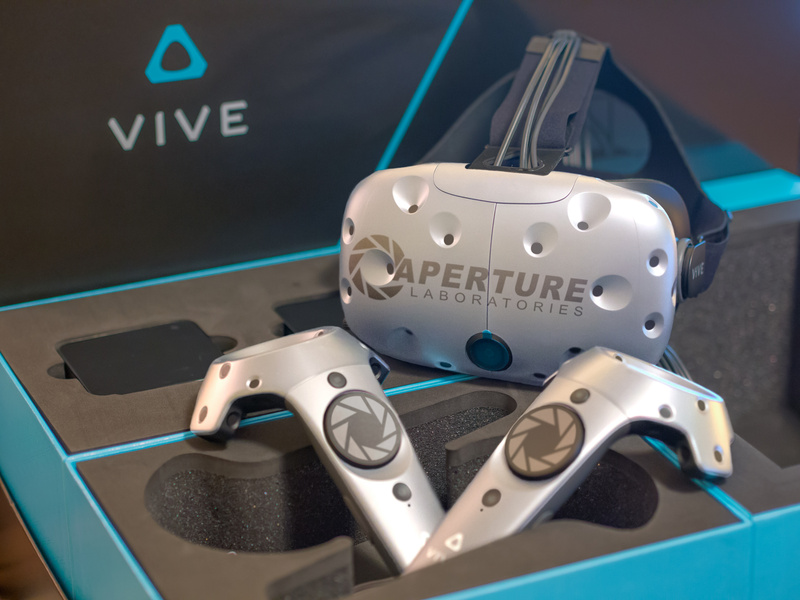 Next up is the Vive, this was also a no-brainer as even Valve themselves are theming their VR stuff after the Portal universe. As before I took a bunch of photos of the hardware and got to work. Honestly I didn’t think this would be much different when it comes to attention, but it kind of blew up in my face on Twitter, at least when compared to what usually happens with my tweets (0-1 likes). It’s definitely my most liked and retweeted tweet ever, and will most likely stay that way for a very long time! I’m assuming the main reason why it caught on is because of the familiar branding. Franchises and IP is so important for recognition, most apparently, and Portal and Aperture Laboratories are well liked brands. This is one reason why making fanart is quite rewarding, you automatically get a (mostly) appreciative audience, I know this myself from back when I was a Halo fanatic and everything I produced was connected to that universe. Back to the Vive and what I had to do to rebrand the product. This Photoshop job required way more effort than the Rift one, I liked the shallow depth of field there so I tried to replicated the effect. It was way trickier when I wanted to change the entire paint job though, I’ll describe what I ended up doing below. Luckily I realised the difficulty of what I wanted to do even before taking the photos, so I shot it at both with a shallow depth of field and with sharpness throughout. To change the color of the blurred image I painted the sharp image and then laid that on top of the blurred one and blurred the edges manually to match the image below. It was quite laborious but ended up being the method that made it look realistic enough to satisfy my creative needs. After that it was a matter of placing the logos and logotypes, I might have rushed that a bit as I was just so worn out after the recolouring and wanted to be done with it, but it looks good enough. I tried applying a curved distortion on the headset logotype but after struggling with that I realised the logo would fit around one of the sensor dimples so I just ran with that instead! As with the Rift job it caused some confusion if it was real or not both on Twitter and Reddit, which when it comes down to it is the the entire point of Photoshopping in the first place, to make something that is not real appear real. For some reason I’ve done stuff like this for what, more than a decade now, meanwhile it’s still just a hobby. This entry was posted in Photography, Virtual Reality and tagged HTC Vive, Oculus Rift, Panasonic Lumix G5, Photos, Photoshop. Bookmark the permalink.